HH Sheikh Khalifa bin Zayed Al Nahyan was elected by the Supreme Council of Rulers (Federal Supreme Council) as President of the United Arab Emirates on 3 November 2004, to succeed his father, the late HH Sheikh Zayed bin Sultan Al Nahyan, who had been UAE President from the foundation of the Federation in 1971. 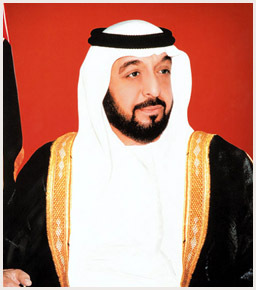 Sheikh Khalifa is also Ruler of Abu Dhabi, having succeeded to that position on his father's death on 2 November 2004. The new UAE President had previously been Crown Prince of Abu Dhabi since 1969. He has committed himself to continue in the footsteps of his late father, from whom, he has said, he learned something new every day, absorbing his values, 'and the need for patience and prudence in all things'. 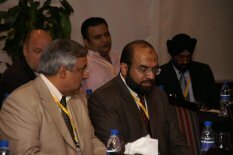 Sheikh Khalifa has been involved in government for nearly 40 years. Born in the inland oasis-city of Al Ain in 1948, and locally educated, Sheikh Khalifa was appointed as Ruler's Representative in the Eastern Region of Abu Dhabi, based in Al Ain, and as Head of the local Courts Department on 18 September 1966, following his father's accession as Ruler of Abu Dhabi the previous month. On 1 February 1969, Sheikh Khalifa was designated the Crown Prince of Abu Dhabi, this being followed on 2 February 1969 by his appointment as the Head of the Abu Dhabi Department of Defence, in which post he oversaw the building-up of the Abu Dhabi Defence Force (ADDF) which later became the nucleus of the UAE Armed Forces. On 1 July 1971, Sheikh Khalifa was appointed as Prime Minister of Abu Dhabi and Minister of Defence and Finance. After the formation of the seven-member Federation of the United Arab Emirates on 2 December 1971, he continued to hold his local Abu Dhabi posts, while on 23 December 1973, he was appointed Deputy Prime Minister in the second UAE Federal Cabinet. Shortly afterwards, on 20 January 1974, he was appointed as the first Chairman of the Abu Dhabi Executive Council, which replaced the emirate's Cabinet. Under his direction, and in accordance with the instructions of HH Sheikh Zayed, the Executive Council oversaw the implementation of a wide-ranging development programme in Abu Dhabi, including the construction of housing, water supplies and other essential services, roads and the general infrastructure. This paved the way for the emergence of the city of Abu Dhabi as the modern metropolis that it is today. Of particular importance in ensuring that citizens were able to benefit from the country's increasing wealth was the establishment by Sheikh Khalifa in 1981 of the Abu Dhabi Department of Social Services and Commercial Buildings, charged with the provision of loans to citizens for construction. Over Dh35 billion have so far been lent by this department, with over 6000 multi-storey buildings being constructed throughout the emirate. The establishment of the department, popularly known as the 'Khalifa Committee', followed another decision taken by Sheikh Khalifa in 1979 to alleviate the burden on citizens of the repayment of loans from the commercial banks. This involved a fixing of the interest rate payable by citizens of loans for construction at 0.5 per cent, with the balance of the interest charged by the banks being paid by government. The formation in 1991 of the Private Loans Authority, to provide loans for residential and commercial property, was another important initiative to use government revenues to assist citizens to participate in the process of development and to benefit from the country's prosperity. Initially capped at Dh900,000, the ceiling on loans for private house-building was raised by Sheikh Khalifa in September 2000 to Dh1.2 million, in response to rising construction costs and inflation. President HH Sheikh Khalifa has also been involved extensively in other areas of the country's development. Head of the Abu Dhabi Defence Force since 1969, he became in May 1976 the Deputy Supreme Commander of the UAE Armed Forces, following the unification of the armed forces of the emirates. In this capacity, he devoted much attention to the building-up of the country's defensive capability, both in terms of highly trained personnel and through procurement of the latest military equipment. As was seen during the 1990a^��1991 Gulf War and in peacekeeping operations in Somalia and Kosovo, the UAE today has effective, well-led and professional armed forces. Sheikh Khalifa has held a number of other top posts in the Abu Dhabi government. Since the late 1980s, he has been Chairman of the Supreme Petroleum Council, in which capacity he has also sought to ensure that the country diversifies its economy away from reliance on oil and gas production. In particular, he has worked to develop the UAE's downstream petrochemicals and industrial complex at Ruwais. 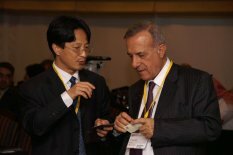 He is also Chairman of the Abu Dhabi Fund for Development (ADFD) (which oversees the country's international aid programme, from which over 40 countries have now benefited); the Abu Dhabi Investment Authority (ADIA) (which manages the financial reserves and investment); and Honorary Chairman of the Environment Agency a^�� Abu Dhabi (EAD). Externally, Sheikh Khalifa is a strong supporter of the six-member Gulf Cooperation Council, believing that the success and achievements of this body reflect the depth of understanding reached amongst its leaders. A keen supporter of the regional policy of HH Sheikh Zayed, in particular in terms of promoting solidarity between the Arab states, Sheikh Khalifa is firmly committed to support of the Palestinian people, displaying this through, for example, his decision in mid-2005 to finance the construction of a new city for Palestinians in the Gaza Strip on the sites of settlements abandoned following the Israeli withdrawal. He is also committed to the promotion of stability in Iraq, through the provision of diplomatic and other support designed to help the new sovereign Government of Iraq to rebuild the country's political system and economic infrastructure. He has stated that his key objectives as President of the United Arab Emirates will be to continue on the path laid down by his father. In particular, he says, he will continue with the 'open door' policy and with the practice of holding regular consultations with the country's citizens, so that he may become aware of, and follow up on, their needs and concerns. Since being elected President, he has toured widely throughout the country, to visit his fellows Rulers in their emirates and to review with them the needs of the people for new schools, hospitals, roads and other infrastructural development.